Another in the series. This is the book I wanted Yendi to be: I’m very happy with this one. I thought this was average for the series. The switch between the POV’s of Kiera and Vlad was well executed overall, added to the depth of the story, and didn’t disrupt the narrative flow. The land plot and associated characters were pretty conventional. It was the other mystery that distinguished this book. Avoiding spoilers, Steve did a brilliant job of hiding an unexpected mystery in plain sight, laying out the clues hoping we might pick up on a few of them. It was very well executed. Overall, I think Steve does detective-style fiction well, especially when he places the clues in advance so the reader can try to unravel the schemes alongside Vlad. Of the various new characters Timmer, Loftis, Hwdf’rjaanci, and Fyres were the most memorable. The villains (avoiding spoilers) weren’t bad, but I don’t think they came across as sharply as they could have. Specifically the one who Vlad killed at the end felt emotionally flat “Yeah, I supposed he/she deserved it”. I think this had more to do with that person not being as “reinforced” like Loraan, Fornia, or Laris. This might be an unpopular opinion, but I think Yendi’s scheme was better designed. If I had to give an analogy, Orca’s mystery was like following a string – Vlad and Kiera figured out who they needed to see next and did so, leading to the need to talk with someone else, etc. Yendi’s was like having strings for each of the different interests involved, but not knowing how they tied together. While the first is probably more true to life, it’s more fun to watch Vlad bind the threads into a lovely bow of logical conclusions after a few mistaken knots than to watch him stumble about until he reaches the end of the string. I think a little more recap wouldn’t hurt in the future. I didn’t read the book all in one sitting, so I had to go back to take notes on what Vlad’s current hypotheses were, and what was unexplained so far. The explanation at the end was well done, so a few similarly styled checkpoints in the middle would have helped. I think an Orca type book with Kragar would work out well. 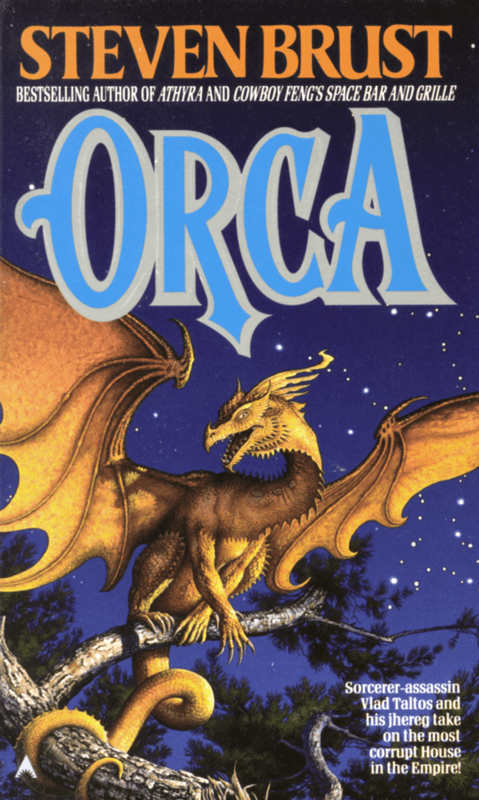 I’m back and forth on where I rate Orca in the series as a whole, but one area where I think it stands among the best of the series is in integrating the titular House into the novel. I know Steve disavows the Cycle poem, but the structure of the novel, both in terms of narration and the actual plot, seems designed around the phrase, “Orca circles hard and lean,” by which I mean that Vlad and Kiera have to circle the central conflict and view it from many angles before they can resolve it and also that Vlad and Kiera had the narration back to each other several times throughout the book. Also, the traits the Orca represent, mercantilism and brutality are present at several levels—Fyres’ fall and the old woman’s foreclosure are the natural, and brutal, result of the kind of economic vampirism that Orca practice. Vlad’s ultimate solution to the plot involves Orca-style brutality—kill who needs to be killed in the most impersonal way possible. And the Empire’s intervention to prevent economic collapse at least hints at mercantilist policies (thought that may be a little of a stretch). Not to mention the fact that the book is littered with Orca acting like Orca from Reega to Vonnith to Fyers himself. If you’d written this book more recently, I’d have thought you borrowed from recent current events. So… What is a Side Captain anyway? Good question. What do you think a Side Captain is? Something to do with a Front Commodore? So I’m not sure if this was ever confirmed anywhere, but was Lord Fyres and his paper empire based specifically on British media magnate and con man Robert Maxwell or is it just a fluke parallel. @ Dennis I’ve wondered that too. I’ve always felt that I can feel the shape of Maxwell lurking in Orca, although attempts to draw exact parallels fall flat. I really loved this book. I finished it in one sitting and at the end when the big reveal hits, I was like, “Damn.” It all made sense at that point and I felt like all was right with the world….which it was. I thought it was the best book in the series so far (I’m reading in the publication order). I tend to listen to books so I bought the audible version of Orca. At first I was concerned at the change of the narrator and alternating between Vlad and Kiera and Kiera and Coti but then I really enjoyed it. I loved the detective character of the plot! Thanks! Thanks much; glad you enjoyed it. In Hungary acting is a profession. In America it is a decision. Am I a Democratic Socialist?